These past few days have been quite tough on the Pakistanis considering the fact that the digital generation had to make do with crawling internet, or no internet at all. 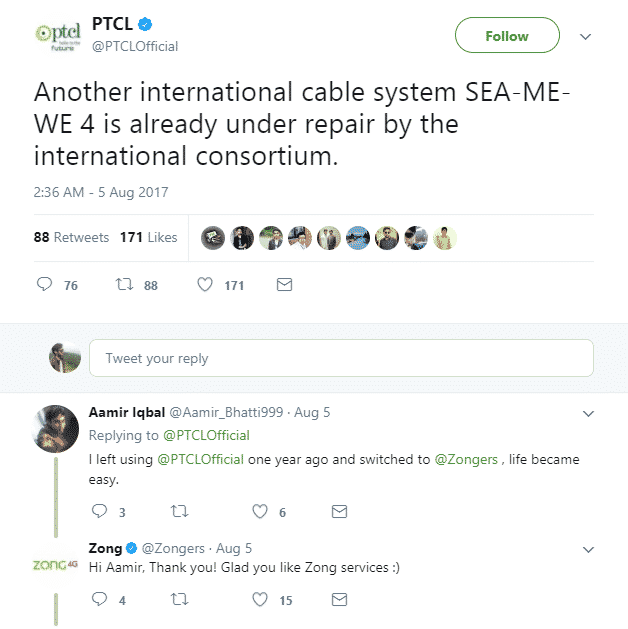 It happened due to a fault in the India-Middle East-Western Europe (IMEWE) submarine cable near Jeddah, which made Pakistanis furious, but their responses on different social media platforms were nothing short of hilarious. PTCL informed its customers about the fault via Twitter, ironically when there was no internet in the country. Despite the crawling internet, Pakistanis found a way to troll the internet providers. Correction: Not slow, "no internet browsing"
Pehle bara rocket ki speed se net chalta tha ? Dunya ka net spoil kr k..how you r tweeting?? This time, they had no answer to it. And, finally came the good news, but the internet users were still angry. The guy who recommended to borrow bandwidth from Nayatel, whether sarcasm or not, it was stupid. I think that guy doesn’t know what he’s saying but just wanted to chip in because everybody was lol.